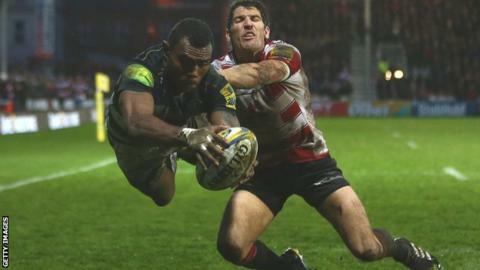 Two second-half tries from Semesa Rokoduguni gave Bath a narrow victory over rivals Gloucester at Kingsholm. Three penalties from Greig Laidlaw put the Cherry and Whites 9-7 ahead at the break, with Chris Cook replying with a converted try for the visitors. Rokoduguni's first finish put Bath in front before Laidlaw levelled the scores with his fourth penalty. George Ford missed a penalty to put the visitors ahead, but Rokoduguni's late score secured a hard-fought win. Sustained driving rain in the West Country made conditions difficult, but Laidlaw capitalised on errors by the visitors to hand Gloucester the advantage at half-time. Bath took the initiative through Rokoduguni's well-taken score, which saw him gather a long pass, step inside and hold off James Hook. The Blue, Black and Whites had to withstand sustained second-half pressure from Gloucester but the hosts could only add three more points through Laidlaw's boot. Ford struggled with his goal-kicking but Rokoduguni powered over with five minutes remaining to give Bath their third consecutive derby success at Kingsholm. "The last three weeks have been very disappointing. "A lot of the stuff we built the early part of the season on, that allowed us to be competing and moving towards the top of the table, just hasn't been there the last three weeks. "It's something we've got to go away from. There's still four games to play, there's still the Challenge Cup ahead. "So while we all feel disappointed we've got to make sure that we turn up next week ready to go again." "Everyone knows what Roko brings. He's unbelievably strong and powerful. "He's a try scorer and every team needs one. He does it for us on a regular basis. He had no right to score the last one. "We've had [England boss] Eddie Jones with us this week, giving us player feedback, and obviously we know that Roko's on his radar. "All Roko can do is play well for Bath and if he does that people will watch." Gloucester: Marshall; Halaifonua, Meakes, Twelvetrees, McColl; Hook, Laidlaw (capt); McAllister, Dawidiuk, Afoa, Savage, Thrush, Kalamafoni, Kvesic, Moriarty. Replacements: Cole, Thomas, Doran-Jones, Galarza, Evans, Braley, Atkinson, Trinder. Bath: Watson; Rokoduguni, Joseph, Devoto, Banahan; Ford, Cook; Catt, Webber, Thomas, Ewels, Day, Garvey, Louw (capt), Mercer. Replacements: Dunn, Lahiff, Wilson, Mafi, Douglas, Evans, Priestland, Agulla.